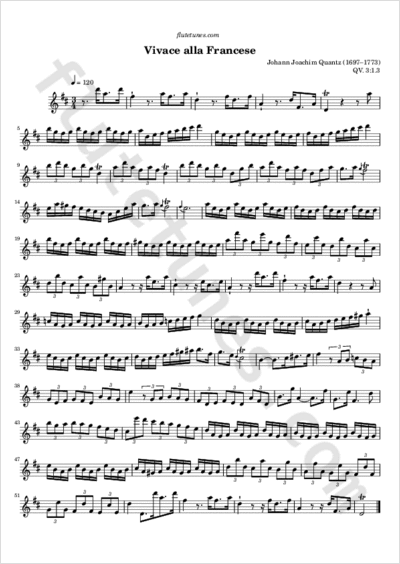 This Vivace “in the French style” is one of 24 pieces attributed to the famous German flutist and composer Johann Joachim Quantz to have survived in a manuscript titled Fantasier og Preludier. 8. Capricier og andre Stykker til Øvelse for Flöÿten af Quanz (“Fantasies and Preludes. 8 Caprices and other Pieces for Exercise for the Flute by Quantz”). This manuscript has been kept in the Giedde Collection (named after its founder, Danish composer W.H.R.R. Giedde) in the Royal Library of Copenhagen, which hosts a fairly comprehensive collection of flute music from the second half of the 18th century.